What To Do When Facing A Floating Ball Of Fire Ants In Harvey's Floodwaters : The Two-Way "Avoid, avoid, avoid," one fire ant expert says. The ants, common in areas flooded by Harvey, can't be submerged underwater. But if you have a bottle of soapy water, you might be able to drown them. Locals have been tweeting photos of fire ant colonies drifting aimlessly in the floodwaters of Hurricane Harvey. What should you do when confronted by a floating raft of thousands of fire ants? Among the many scenes of devastation coming out of areas flooded by Tropical Storm Harvey, images of floating rafts of these ants have gone viral on social media. The ants are common in the areas of the Southern United States that were hit by the floods. The floodwaters lift the ants from their anthills on the ground, and clinging together, they are capable of drifting for miles until they find dry land to re-establish a colony on. The sight of hundreds of drifting rafts of red imported fire ants is nightmarish for anyone who has felt the ant's fiery sting. In extreme situations, they are capable of sending a person with an allergy into anaphylactic shock. Paul Nester, a Houston-based fire ants expert at Texas A&M's AgriLife Extension Service, has this primary advice: "Avoid, avoid, avoid." Give these rafts of ants a wide berth. He says people shouldn't try to poke the raft or try to drown them by pushing it underwater. It will backfire, he says: "If anybody comes in contact with that, hits it, well then, the ants immediately will stream onto that person just like they would onto a log or onto a bank because they're looking for high ground." Fire ants are expert survivalists, he says – even pesticides are only up to 90 percent effective on them. "You always have a surviving part of the population," he says. However, in a flood situation, there is an unexpected way to battle the balls of fire ants: spraying them with diluted biodegradable dishwashing liquid, at a ration of about two tablespoons of soap per gallon of water. The ants will slowly start to drown and die, Nester says. Here is why that works. Fire ants are nonterritorial, meaning that you can sometimes find more than 500 mounds per acre. And as floodwaters come through, "you can just think of them bubbling out of the ground and then they get up on the water. They're in this ball that has a high surface tension so the water can't encroach on the interior." These rafts contain all members of the colony – the queens, the workers, the eggs, the larvae. And they can survive a mileslong trek, Nester says. "If a wave hits, it doesn't matter. It's such a high surface tension that that raft is just not affected whatsoever. ... They form such a close ball the water just can't penetrate." The ants achieve such a high surface tension by intertwining their legs, forming a kind of mat, Nester says. Their bodies are covered in an exoskeleton that repels water. However, Nester says when you spray the soap mixture on the raft, "it tends to reduce that surface tension and the ants start to break off and they basically all drown." Nester acknowledges that "not everyone has a bottle of soapy water in their pocket while they're walking down a flooded area." Without one, it's best to steer clear. Rafts of ants can also present problems to people navigating flooded areas by boat, Nester says. The floating colonies can "just kind of explode onto" boats, or climb onto paddles. 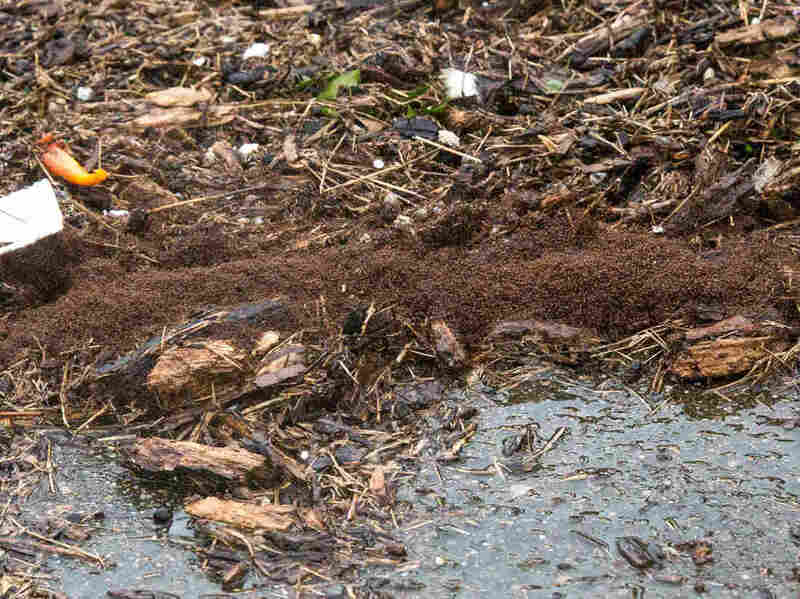 As rescue efforts continue, he warns that floating fire ants rafts will often take refuge in debris piles. That can be dangerous for people working to clean up and rebuild. If you find yourself covered in fire ants, Nester says you should avoid jumping into water or trying to hose them off. The water just makes the ants cling to your body even harder, and it can make them more likely to sting you. "We really recommend that people just brush them off to the best of their ability," he says. "They're originally from the wetlands of Brazil, where it's flooded several times a week. When that happens, they have to pull their entire colonies out from underground, which is where they live, and they have to float around and survive in this fashion. They've been really forced to rely on each other in a way that's far deeper from other ants."